The members of Jaggery have long been multidisciplinary types. The band’s sound, which might be described as restless chamber-pop, has proved fertile ground for collaborations with dancers, video artists, and various other forward-thinkers. For its newest project, the band has chosen a rather boldface name to work with: Leonardo da Vinci. At Jaggery’s show at the Museum of Fine Arts on Friday, the band will present a program of songs in response to the Italian artist. Cued by an exhibition of his drawings (“Leonardo da Vinci and the Idea of Beauty”) now on view at the museum, frontwoman Singer Mali says that Jaggery’s focus on notions of the beautiful and grotesque fits right in with its aesthetic. “We’ve been finding inspiration not just from those specific drawings, but from Leonardo’s life and his works in general,” Mali explains, huddled with a cup of espresso in the band’s basement rehearsal space. She lives upstairs, in one of the twin South End brownstones populated by other creative types and known collectively as the Cloud Club. Former resident and fellow Lexington High School alumna Amanda Palmer hipped Mali to the space back in 2008. 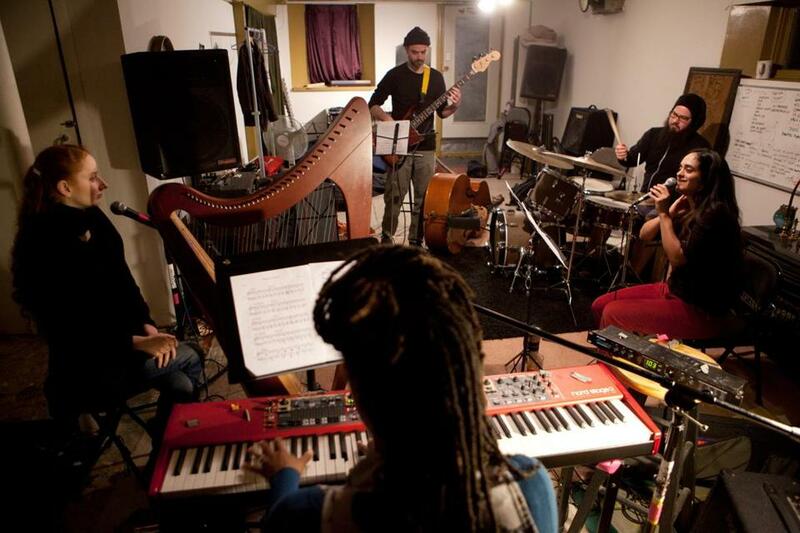 Mali, who is the band’s lead vocalist, songwriter, and keyboardist, started putting together the core of Jaggery in New York four years before that. She, drummer-percussionist Daniel Schubmehl, and acoustic bassist Tony Leva have been the core trio for more than 10 years. The band found that its best gigs seemed to keep happening back home in Boston. The conceit of the MFA show is harmonious with Jaggery’s multimedia ethos — and one song will indeed feature a collaboration with dancer Kimberleigh Holman — but the new song cycle is also a departure for the band. Typically the sole songwriter, Mali called on the other members of the group — who also include harpist Petaluma Vale and drummer Dylan Jack — to contribute new compositions. Leva is fond of coaxing unorthodox sounds from his bass, and the assortment of auxiliary tools scattered in the rehearsal space — including clothespins, a butter knife, and a screwdriver — attest to this fact. He demonstrates one bowing technique that results in a high-pitched shriek. There seems to be plenty of room for that. Mali admits she had no grand plan that resulted in Jaggery’s unorthodox instrumentation, which adds flavors from European classical music to music that feels startlingly intimate, with emotionally expressive vocals that seem to reflect more than a passing interest in similar influences as that of Palmer and the Dresden Dolls, for whom Jaggery has opened shows. Schubmehl’s moody textures on drums might be called jazzy, not because of his approach to swing but because of an essential openness and flexibility. For the MFA show, Schubmehl wrote a piece inspired by the long correspondence between music theorist Heinrich Schenker and artist Victor Hammer, in which, Schubmehl says, Hammer impressed upon Schenker the importance of great representational artists like da Vinci. “A melody started coming into my ears really quickly,” while reading an essay about this correspondence, the drummer says. The topic might seem an unusual inspiration for a song. But in the ever-creative world of Jaggery, that must be high praise indeed.